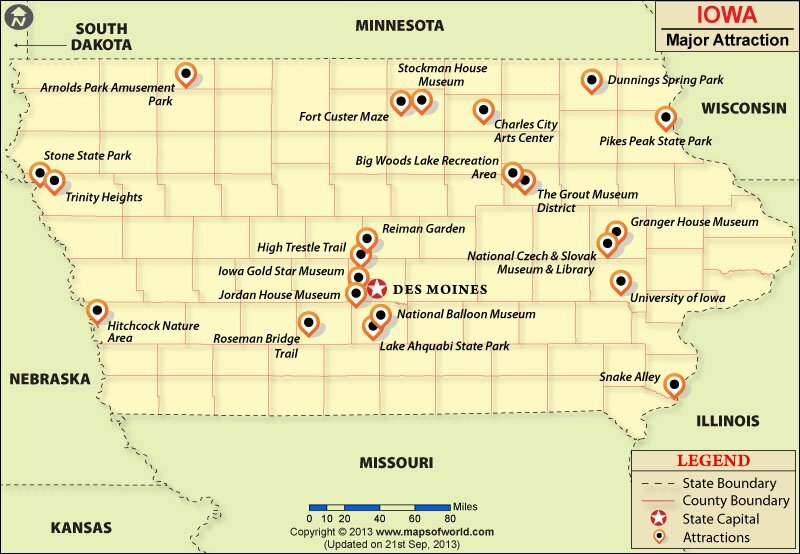 Iowa has many attractions spread across the state. The capital of the state, Des Moines, is home to many historical sites, including Des Moines Art Center and numerous other museums. The Ambrose A. Call State Park is located in Kossuth County, Iowa. It commemorates the first settler in the county. The park is at an elevation of 1,224 feet and covers an area of 138 acres. It has a lodge which was built in 1928, a campground with 16 sites, and a 2 miles trails wind through the forest area. Founded in 1925, it is managed by Iowa Department of Natural Resources. The Herbert Hoover National Historic Site is located in West Branch, Iowa. It commemorates the life of the 31st President of United States and is managed by the National Park Service. It was declared as the National Historic Site on August 12, 1965 and as a National Historic Landmark on June 23, 1965. Also known as the Herbert Hoover Birthplace, it is spread across 187 acres of land. The compound includes a small cottage where Herbert Hoover was born, a blacksmith shop, the first West Branch schoolhouse, Herbert Hoover Presidential Library and Museum, tall-grass prairie, and a Quaker meetinghouse. The Blood Run Site is located on the border of Iowa and South Dakota. It is an archaeological site and was probably built over three millennia ago. It is managed by the Multi-Cultural Indigenous and was added to the NRHP on August 29, 1970. Within this site, there are earthwork structures which were built by the Oneota Culture. The Des Moines Art Center is located in Des Moines, Iowa. Established in 1948, it is an art museum exhibiting paintings, sculpture, modern art, and mixed media. The architecture of the original building is credited to Eliel Saarinen, and was in 1945. It has permanent collections of Edward Hooper, Jasper Johns, Andy Warhol, Henri Matisse, etc. The second wing was designed by I.M. Pei in 1966, while the third wing was designed by Richard Meier. Reference Library, restaurant, and a gift shop are also part of the Art Center.